My lovely card from Colin and Katrina in New Zealand, says it all, thank you both. We have a partially functioning very old computer, at last I can type properly and upload photos but not edit them so apologies for the poor quality. Still no proper computer, the local IT man couldn't fix ours so Mr FF is doing extensive investigation and there are lots of pieces from the machine on his desk. I am a bit fed up that I'm neglecting my blog and my friends, normal service will be resumed eventually so please hang on. Meantime we've been down to Yorkshire on a Santa run and the heating is fixed. This did involve three attempts to get under the floor boards and taking up the hall carpet that was only fitted, beautifully last year. So Mr FF, never knowingly defeated, has sourced one of those kicker things and hopes to have the carpet reinstated for Christmas. Speaking of which, I have made the usual half hearted effort for the festive period. We have abandoned our usual £5 stockings and decided not to give each other presents at all. I sent a cheque to charity and feel quite sanctimonious, also relieved not to have to traipse round the shops or add more items to our household. We have two large steaks for Christmas dinner, cake, chocolates and drink, I hope you have enough too. Apparently I can't get an appointment at my hairdressers until after the New Year. In Italy I visited the barber in the village where Mr FF goes. Andrea only offers two styles, as evidenced by the male population, but I was able to get him to give me a version of the not too short one. That was weeks ago and I definitely need attention, why does everyone suddenly need a haircut. Mr FF is on the case for the second and third problems, meantime until I can get him to crawl under the floor boards our new all British wool duvet is keeping us cosy. If I can't get my hair cut I'll be staying in bed till January. We had what Mr FF would call a picturesque drive back from Italy, lots of snow on the alps but fortunately none on the roads, more snow and freezing temperatures in France, blizzards over Bowes Moor on the A66. Finally we arrived home to discover our driveway covered in sheet ice, several attempts to get the car up, then we could barely climb the steps to the front door. As I said picturesque. Our stop overs were perfect, one night in a modern efficient Novotel outside Milan, one in a delightful French B&B, two nights in Yorkshire with my brother where we met our new grand niece and sister for Amelia, Esme Sophia arrived while we were away and is now 3 weeks old. The enthusiasm to be back didn't last long, we both have colds, haven't had one of those for ages, feeling drained and lethargic. The central heating isn't working in the bedrooms, which isn't a major problem but means Mr FF is going to have to go under the floorboards at some stage to check things. Then there's the small matter of Christmas. I have told my family they will all get an Italian lucky bag this year, odds and sods I've picked up for them. I'm also rootling through cupboards for anything to add, I just can't face going to the shops though I will have to go out soon as we don't have much food in the house. Today knitting in front of the fire calls, though I must catch up with all your blogs so please don't be posting about how organised you are for the festive period it will only depress me. Proper photos etc later in the week meantime I hope this one makes you feel warm, enjoy your Sunday. from Milan. Big day of travel today, those bloomin Alps. From our comfy hotel we are surrounded by mountains and most of them are white. Hopefully we will be in France tonight and through the tunnel on Tuesday. Driving home for Christmas indeed. I'm devastated that we are practically out of Yorkshire Tea. I just made a brew and I can see the bottom of the canister. This is a disaster, every morning the first thing we do is make a large pot of tea, Mr FF takes his out onto the terrace to listen to the Today programme on radio 4 and I enjoy mine in bed whilst reading. So we plan to start the long drive home in about ten days, Mr FF has ordered the snow chains that are obligatory when driving through the Alps in winter. For want of a tea bag the dream is over for another year. After I started picking our olives we had a couple of wet days which put the pressure on, you can't pick wet olives as they won't keep and you don't want to keep the already picked olives waiting too long before they go for pressing. So I was delighted on my birthday to receive an offer of a days help from our lovely Danish friends. I managed to collect 4 crates myself on dry days before they arrived on the Saturday, equipped with their own nets and rakes and we spent a happy if tiring day harvesting and chatting in true Italian style. Hans and Tenna stayed on and had dinner with us, did I sleep well that night. The plan was that in Monday we would drive to a local family run frantoio where we would meet up with a friend of Marios and combine our harvest with his as we probably wouldnt have enough for our own run. However when we got to the mill, had our crop weighed at 207 kilos and waited for Vincenzo to arrived Mario received a phone call to say that he had had a puncture and would be delayed. Some discussion with the owner, more waiting, a coffee and finally our olives were tipped into the hopper, the process began. We watched them go along the conveyor for washing, be crushed by huge stones, saw the resulting paste, which I thought looked very much like cat sick, spread onto pads that were piled onto a large spike and then put under pressure as very murky oil and water seeped out. After almost and hour the reservoir underneath was connected to a very magical machine, the liquid was pumped out and beautiful green oil poured into a tank. The proprietor said it was excellent oil, Mario said it was OK and I was euphoric. We paid 25 euros for the millimg, shook hands with the family and came home with 40 litres of hand picked, extra virgin, stone crushed gorgeous glossiness. We have made bruschetta for the last four nights with this delicious new oil, we can't get enough of it. People are still picking all around us, the mills are working flat out. The lady at our frantoio told me they work 4 am till midnight for 2 months, parents, a son, a daughter and her husband all efficiently helping each other and I'm sure they've never had a days team building training in their lives. We are so lucky to have such good pure oil, I've also been reading lots about the various scams selling imported stuff as Italian, mixing cheap vegetable oils and claiming them as extra virgin olive oil.My opinion of big business never improves, my admiration for people who work hard to produce something so wonderful increases daily. Although we've not been back in Scotland very long, constant days of cold and rain, wearing too many layers of clothes and struggling to get the conservatory renovations finished have made our days in the sun something of a distant memory. Lets take a look at what we got up to. First of all, this is the view from our hotel bedroom at Montreux, the stopover where Mr FF said he'd rather sleep in the car than pay the cost of the room. For me the £220 bill, including dinner and breakfast was worth every penny. Mr FF not only shipped out the 1.2 m sat dish, he also sourced this rather ugly aerial which he temporarily fixed to our sun umbrella. Of course he relocated it to the roof, fixed up the new dish and there was UK tv beyond our expectations. A day on the beach, I love the Italian beach culture and am happy to sit in my allocated line people watching and enjoying a distance glimpse of the sea. We actually enjoyed the trip so much we went back, to different locations, twice more. I don't have a photo but I'm happy to report that one of the cats that lived with us last summer reappeared, we think it was Paolo one of the ginger and white ones. He looked fit and obviously well fed, accepted the food we gave him but always went off afterwards, which leads us to believe that he has found a proper home and hopefully the rest of the tribe did too. Finally, a gorgeous gift from our neighbour Mario. Beautiful veggies that fed us for days. Mario has a piece of land lower down in the village, where he tells me the soil is better and presumably the climate too. He told me that for August and September his family is completely self sufficient, with enough fruit and veg for bottling and freezing plus plenty to give away. If only he could bottle some of that sunshine for me I'd be unscrewing the jar right now. Having received the scaffolding on Monday it took Mr FF quite a while to erect the two towers which I was pleased to note were quite sturdy if extremely tall. The intention was to have a bridge between the two to provide a walkway and safe area over the roof of the conservatory from which to work. I had asked beforehand how we would get the walkway up there but Mr FF dismissed my girly concerns with some engineer speak involving ropes so I didn't pursue the matter. I was told yesterday that it wasn't going to be possible to put up the bridge single handed, its the piece you can see leaning to the left of the tower in the photo below, big and heavy. I certainly wasn't interested in helping, far too scary. Mr FF then admitted that he didn't really want to go up onto the walkway and do the repair work himself. So after a few phone calls we have found a local builder who is currently erecting his own scaffolding, assisted by two workmen, and he is going to do the work. Phew. Tomorrow the new glass is due to arrive, hopefully quickly followed by the glaziers and meantime Mr FF is using his scaffold to check other, lower, parts of the house roof, ie justifying the weeks rather expensive rental. I can't wait for the work to be completed and for us to get back to Lazio. You can see it's bright and sunny here but I feel permanently cold, there is a definite feel of autumn about and I don't like it. We flew back from Italy on Friday but only for a couple of weeks and my flip flops are packed away in Lazio awaiting my return, no I didn't leave them on the beach. We've had a great time and so far being home isn't too bad either though wearing socks and jumpers is a novelty that might not last. I started the garden catch up yesterday while Mr FF was out walking with his group. Tomorrow we begin the renovation of our conservatory here, several of the double glazed units are blown so there is condensation between the panes and all 14 units are going to be replaced. I managed to dissuade Mr FF from tackling this himself, far too scary and not a suitable occupation for a man who turned 64 last month. I want to knit something to take back to Italy for a new baby, I need to think about Christmas as it might be November before we drive back to the UK and I must get my hair cut. So no time to linger. I'll catch up with you all over the next few days and tell you what we've been up to over the last 6 sunny weeks. This week I've mainly been packing as tomorrow morning we set off to Italy again, this time in the car accompanied by the 1.2 m satellite dish. As ever there are masses of domestic items to take out, new crockery, towels etc as well as a large variety of my summer clothes, that haven't seen the light of day in Scotland and deserve an airing. As ever Mr FF hasn't started packing yet, he likes to brag that it takes him 5 minutes to throw his things into a case, but we have been known to go out shopping for clothes he's forgotten and every few days he'll ask me 'have you brought any aspirin, sun cream insect repellent' etc. I rest my case so to speak. I've also been attending a 4 week jewellery making class, this is my necklace from the first session, it's the final class this afternoon and we're knotting pearls. I don't think mine will be finished for the journey but I'm hoping to release a bit of pre-travel tension, just hope my knots aren't too tight. Be in touch as and when I can, we should arrive in Lazio on Wednesday. As ever I've been glued to the Tour de France for the last three weeks. What a journey, I'm exhausted, goodness knows how Bradley is feeling. Since we witnessed a crash at close hand on the Giro I've had very mixed feelings about the lovely boys risking so much for their sport and I've been on the edge of my seat worrying through every stage. Yesterday I thought I'd have to leave the room as Bradley led out Mark Cavendish for the final sprint on the Champs Elysees. I must be getting old, I've found that I much prefer watching the evening's edited highlights knowing that they are all safely home and the days job is done than watching the live event. History has been made, the first Brit to win the Tour de France but no respite as team GB now prepare for the Olympics starting with the road race on Saturday. Fantastic. I've nothing but admiration for the way those boys have behaved, totally focused, articulate and charming (well OK Brad did have one foul mouthed outburst but I allow him that). 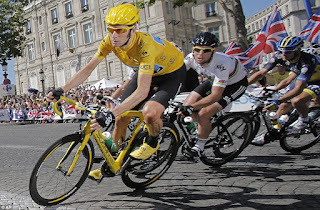 They've all been team players working for one goal, witness Mark Cavendish, a world champion himself, missing out on several potential sprint victories to fetch drinks bottles for his colleagues or carry Bradley's waterproof. 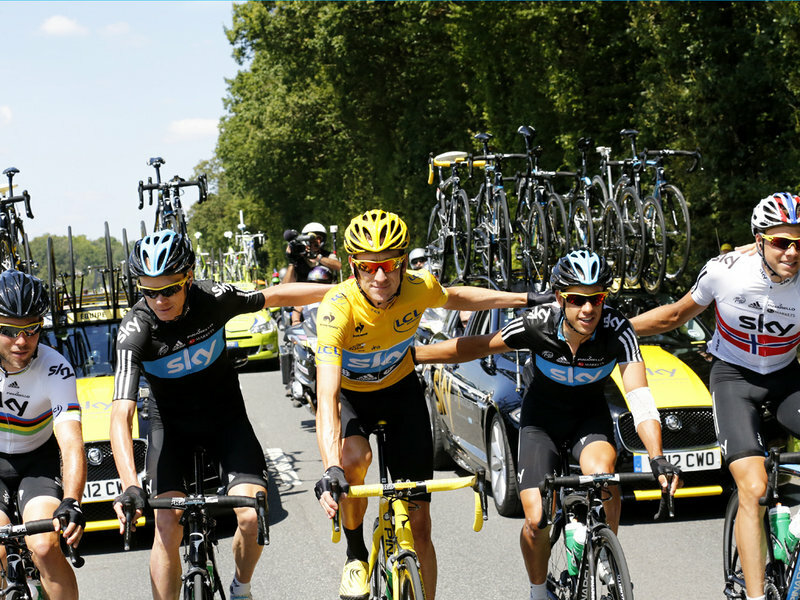 Great role models and much of the credit should go to the Team Sky boss, Dave Brailsford who engineered this success. As Mr FF said, if this down to earth Dave was running the country we'd all be a lot better off. If you know anything about me you must know I am no fan of big business. Hearing recently that disgraced Barclays boss Bob Diamond is to fore go his £20m bonus and leave with just £2m as severance pay does nothing to improve my impression of the way things are done at the top. I've recently had a debacle with that once doyen of British retail Marks and Spencer. I ordered on line a plant to be delivered to my sister in law for her 60th birthday, the order duly acknowledged and the day before it was due I received an email to say that the gift was on its way. 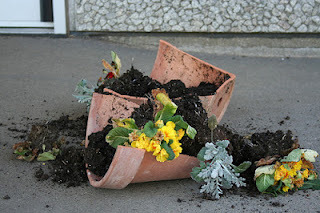 I didn't hear from SiL until a couple of days after her birthday when she told me her gift had arrived, 2 days late and the decorative terracotta pot was smashed to pieces. I phoned M&S who were very helpful, apologised and said they'd send another immediately. Next day SiL phoned to report that the new plant was much fresher and a completely different variety to the first one. I'd ordered an alstromeria but they had initially delivered a zinnia, strangely at complete opposite ends of the alphabet. I was a bit put out by this and spoke to M&S again, extracting from them £5 compensation which since they put this onto my online account would probably incur £3.50 delivery cost so not much compensation after all. I then received an email from M&S asking me to review my purchase, I wrote that the gift arrived 2 days late, the pot was broken and the plant was not what I'd order so basically everything was wrong. M&S rejected my review as it didn't meet their guidelines, again causing me some irritation. I rewrote my review giving the lowest scores possible and saying simply I'd been disappointed, they published this but really it was no use to anyone, readers might imagine I was simply a fussy shopper. Much of the fault here may lie with the courier but my contract was with M&S and delivery on the right day was a big part of the product. Recently M&S published reduced sales figures, why am I not surprised. It never fails to amaze me that in these days when money is in short supply the paying customer is not more valued. At the opposite end of the scale, Mr FF had a pair of Timberland shoes he bought at least 5 years ago and loved very much. The soles started to come away and despite his attempt to glue them back he couldn't fix them so he spoke to Timberland asking for advice. They suggested he return them and they'd take a look, reporting back that the shoes couldn't be fixed but he could select a new pair to the same value from their website and they'd send them out. The ones he decided on were more expensive than the originals but he was happy to pay the £35 difference after all he'd already had good wear from the old ones. Timberland wanted to deliver the new shoes while we were away in May but as this wasn't possible they agreed to wait till we came home. Unfortunately the shoes went out of stock and couldn't be delivered until late July so they said they would waive the £35 extra charge to cover his inconvenience. Today a brand new pair of Timberland shoes arrived by courier, no fuss, no argument and customer service beyond what we expected. Finally, on a slight tangent, Mr FF though retired is still on some online networking site and received notification the other day that one of his contacts has been promoted to Chief Imagineer and Ideation (though shouldn't that be Ideationer). I had to google these job titles as they meant nothing to me and guess what both have references to Walt Disney, yes the magic kingdom, the world of make believe. Personally I'd rather be called the Office Twit that the Imagineer, but then I'm from Yorkshire where folk can't be doing with flannel. Come on business giving each other fanciful names and ignoring the customer won't get you anywhere, the great majority of the public is not as stupid as you seem to think and this one and her husband in his brand new Timberlands will be giving M&S on line a wide swerve. I hardly use my little yellow car nowadays, its 12 years old and not so reliable but living out in the country it is handy to have a second vehicle. This week we took my car to have the wheels restored and resprayed, mainly because the tyres kept deflating and it was recommended we have this work done but also it has made them look very smart. cats and mice on the upholstery and I keep a variety of things in the very small boot and the various compartments, mainly left overs from my commuting days when there was always a chance I'd be stuck in the snow. It never happened to me but once I wisely stayed in town, a neighbour attempted the drive home and spent the night in his car. a mac, a torch, tow rope, a pair of lightweight coverups (in case I ever decided to service the car presumably), a first aid kit, a cosy wool blanket and two foil space blankets, a complete change of clothes including some running gear from the days when I did run a lot, even some sleepwear and two pairs of clean knickers. There's some small change, a little notepad and a pencil and maps of places I've never visited in my car. Toiletries, it's important to cleanse tone and nourish even if you are stuck in a snow drift. So when I was having a clean out in the car, thinking I really didn't need all that stuff (will the downsizing never end) I was surprised to come across this roll. Mr FF had given me a tool kit years ago, obviously I was never going to use any of the contents but he said it would be good to have in case someone came to my rescue without the right gear. He'd forgotten all about it so he was delighted to have it back, said he'd often wondered what had happened to it. Now I need to give my car a good clean and maybe think about just a few minimalist accessories. Actually I'm quite surprised I didn't find any knitting in there. That should really read they both fit. Firstly Mr FF went off to collect his eBay sat dish slightly concerned that it wouldn't go in the back of the car. I noticed he packed various ropes and tapes but fortunately though a little snug the dish went into the boot. I can see we are definitely taking the car to Italy and that we shall have to fit the rest of our luggage round the dish and its stand. The dish has already had a good clean with the power washer and is looking good. Lets just hope that it makes a difference to our tv reception otherwise there could be ranting in Lazio. Secondly Mr FF's New Lanark 'I want it just like the old one' jumper is finished and fits a treat. Couldn't resist including my herbaceous border in the background. This new jumper certainly is as requested just like the old one which I might give a bit of a renovation now as some of the seaming at the wrists could do with attention. I used 11 balls of DK, the pattern is a straight forward classic raglan from some old book I have. Time for a bit of stash busting now to continue my downsizing theme, too many showers for me be in the garden very long so frantic knitting to be done while I get over excited watching the Tour de France. I didn't tell you that during our previous trip to Italy in March Mr FF got chatting to an English man in an electrical shop who had lived in Italy for 30 years and told Mr FF that he was able to receive UK tv on a 1.2 m satellite dish including BBC. Mr FF was obviously intrigued by this and when we were back in Italy in May he managed to purchase on eBay Italia a similar dish that was delivered to our house. Suffice it to say that we didn't receive any more stations on the tv than we were getting with our existing two dishes. He rigged up the new larger dish on the terrace as a temporary measure but there was no increase in our available watching choices. Still nothing wasted, as I remarked at the time the dish makes an acceptable sunshade if you positioned a chair underneath it. Mr FF dismantled the contraption before we left. Yesterday he was back on eBay UK and has now purchased another 1.2 m dish that he tells me is a much better specification and will probably do the trick. We have to travel up to Stirling to collect it and transport it out to Italy, assuming it and we and our luggage can all fit in the car. On a more positive note I have finished and delivered to her Gran the two little cardigans for Millie. And not quite so positively in light of my last downsizing post, I have purchased a selection of unnecessary plastic items from the Ikea sale, twice as much as shown in the photograph, the other half together with a set of salad servers is destined for Italy car space permitting, . Nothing cost more than 20p so how could I refuse. Peppers are the models own or should that be a serving suggestion. I've been retired almost 4 years now, Mr FF a year, and we've both come to the conclusion that we have far too much 'stuff' and particularly too many work related clothes. I'm not a hoarder, I have plenty of clear surfaces in the house but sometimes feel overwhelmed by the amount of possessions we have accumulated over 42 years of marriage. We want to spend more time in Italy so we've started to consider moving to a smaller lock up and leave property that is close to shops and services, though not just yet please. We love our house and garden here and can't contemplate living in an apartment with perhaps a balcony but no real outside space. Where would we keep our bikes, what about all the things in the workshop, our extensive stock of wine, my stash of knitting yarn. We'd miss our lovely wood burning stove, the greenhouse, our view of the hills, everything. We have to tell ourselves we'd still have most of these things in Italy including a garden to which we could devote more time and grow lots of interesting plants, like outdoor tomatoes. It all feels very scary so I've adopted a policy of downsizing gradually, like reading from my stock of books then taking them to the charity shops without bringing more home. Mr FF has entered into the spirit of things and had a good sort out in his wardrobe. I think he was a bit surprised to rediscover unworn clothes and actually shocked at the number of business suits he owns and will never wear again. We sorted items into three departments - charity shop, textile bank and family, by the time we finished there were twice as many bags as these. Tiny steps and to be honest they haven't made much difference physically or mentally so we might end up shipping everything to Italy, plenty of room for it all there. This is an unfinished articles post, I'm blaming my lack of knitting progress on Euro 2012, the bloomin football is on tv every evening at the moment. Mr FF is managing to watch two matches per night and although we have more than one tv because the weather is so awful we are both sitting in front of the stove in the family room neither prepared to move away from the heat. So I'm not settling down as normal and not doing much knitting. I did produce a couple of pairs of socks while we were in Italy, patterns and yarns I've used before so you don't need to see them. Since we returned I've made this little wrap top for Pam's latest grandchild who was born on Sunday 03 June, the day of the Jubilee celebrations on the River Thames. I suggested the little girl be called Pageant but apparently they have gone for Millie. I need to stitch it up but that's not my favourite part of knitting, I've been spoilt by socks, so I've started a little bolero top for the baby too. Meantime Mr FF hasn't been well, suffering the same kind of bladder infection as Prince Philip, though sadly Princes Harry and William haven't been here to visit. I was at the dentist this morning, Mr FF said he would like a run out, he's not driving at the moment as one of his symptoms, in addition to moaning a lot, is dizzy spells. He seems to enjoy being driven round, says he sees a lot more and today there were only 3 criticisms of my driving as opposed to 4 when we went out on Sunday. After my visit to the dentist, no treatment needed, we went to New Lanark, a lovely UNESCO world heritage village that Andamento wrote so well about recently with some great photos, I of course forgot my camera. After a coffee and scone each in the cafe, gorgeous industrial architecture, we achieved the main purpose of our visit, to buy some yarn to knit Mr FF a new jumper. I really like supporting New Lanark, their yarn is lovely, using British wool and traditional methods and its as economic for us to visit as pay postage plus we get a nice trip out. Mr FF chose the graphite dk with 10% silk he had for his last jumper, said he wanted exactly the same plain round neck he had before, simple. Wouldn't it be nice to sit down of an evening in front of the fire and watch some gripping drama whilst knitting away but oh no, apparently we are not much more than half way through the two matches per night stage of the competition, that boy might have a long wait for his new jumper. So we have this lovely house in Italy and I'm really grateful that we do but I have such mixed feelings about renting it out. I'd be so happy to leave my clothes in the wardrobe, find everything where we left it when we return and not have to worry about keeping up standards generally. However, letting the property out to holiday guests does bring in money to pay the bills, community charge, tax, water, refuse collection (even though the door to door collection recently introduced is not coming up our road because the electric vehicle can't manage the climb so we end up taking the rubbish to the tip or isola ecologica as it prefers to be called ourselves while still paying full whack). I also think its better for the village generally that the house is occupied, it must bring in some income for the local shops and services and our neighbours who look after the property for us love having guests around. So that's what we do, the guests book direct with us, no agency or middle man, Mario lets the people in and explains whats what, Lina does the cleaning and laundry, to an exceptionally high standard I'm pleased to say. However, the last time we went to the house Lina hadn't been too well so she had simply stripped the beds and not done any cleaning. What an eye opener that was. The only guests, 5 adults, had been in the house 5 days and the place was filthy, old food and wrappers on the kitchen floor, fag packets under the bed and lets not talk about the state of the toilets. I got stuck in and cleaned the place, fair enough, but what really annoyed me was the way pans and crockery had been put away dirty, the coffee maker put back in the cupboard still with the old grounds in it. Even my pretty oil cloth, that matches the bigger one so that both outside tables go together, had been put away in this condition, totally ruined which made me very cross indeed. Everything was mixed up, I know its hard to remember where you got things from but logical to keep similar glasses or plates together. I have good quality equipment. Originally we provided playing cards and an assortment of jigsaws till we went back once and I found cards in the garden ruined by the rain and pieces of jigsaw blowing around from goodness knows which box. We take a small security deposit but this wouldn't cover a major breakage so really we are working on trust. Obviously its impossible during a short changeover time to check everything and few people admit to breakages hoping they won't be noticed. The great majority of our guests are lovely, give us useful feedback and have been known to leave small gifts for the house, herb plants, candles, little bits of pottery, all of which I really appreciate. I don't want to stop renting the house, I don't want to lower the standards but I do want people to realise it is actually our home they are staying in, our personal items they are using and treat it all with respect. Not too much to ask surely. I know we are celebrating this weekend the Queen's succession to the throne and that the coronation took place a year later, but I just couldn't wait to show you this photograph. 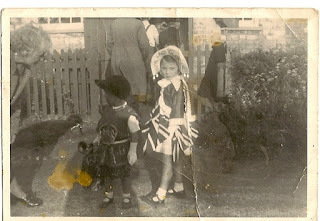 Here I am 59 years ago, which explains the state of the photo, just about to enter the village hall, known then as the reading room, actually the old school and now a private house. There was a tea to celebrate the Queen's coronation in my North Yorkshire village and I assume all the children were in fancy dress. I was the Queen of Hearts I believe, it says Happy and Glorious on the brim of my bonnet, my brother standing beside me was a Royal Trumpeter and my dear Gran is on the left. I don't recall much about the day, I was 4.5 years old my brother 2.5, but I do remember my lovely dress, made by my Gran as was my brother's outfit. I also remember that my brother absolutely refused to blow his royal bugle, my Gran was probably trying to persuade him to have a go while the photograph was taken. I can remember having a good blast on the trumpet myself and my brother probably played a right royal fanfare after the event. There is no village tea here in Scotland for the diamond jubilee but a beacon will be lit on the highest hill, Black Mount, at 10 pm on Monday. If I'm still blogging next year I can show you my 1953 Coronation mug, every child in the village got one and in 1977 I returned to stay on the farm with my parents for the silver jubilee weekend. Mr FF and I decorated the road through the village with home made bunting, cutting up old fertiliser bags into triangles and stapling them to agricultural twine, we must have made miles which we fastened to telegraph poles. At the village tea all the children received a mug and as a surprise and thanks for the decoration I got one too, I still have both my mugs on display. To mark the occasion I've fished out my Emma Bridgewater patriotic shopper. enjoy your royal weekend. Last Saturday we travelled into the Abruzzo to watch a Giro stage finish. We had a spectacular 3 hour drive over the mountains, reaching at the top of the pass a sign that said the road was closed. Obviously Mr FF knew better, drove round the barrier and past piles of snow at the roadside. I was a bit reassured to see a family picnicking as we travelled down, then to see a car coming in the opposite direction. I know it might have been travelling the same way as us and had to turn round but somehow it was a comfort. We eventually reached our destination, a little hilltop village where we had to park On the approach road and walk but we had our own picnic and plenty of time. The usual Giro circus filled the tiny streets and the place was full of people and noise. We found a great viewing position, uncomfortably between the barriers for the cyclists and the road crash barriers before a steep drop but we were able to see the riders approach below and then again as they came out of a sharp bend and accelerated past us to the finish not far away. Wonderful, exciting cycling, a great if long day. Monday the Giro came to Lazio and we had less than an hours drive to the finish. Just as well we arrived early and I refused Mr FFs offer of a tour of the (closed naturally) fashion shops as I was keen to get into position. Despite checking the road name on the net and on the tv, the one given was completely wrong. We walked the full length of Viale Roma and not a sign of the event. Fortunately the men we asked knew where we needed to be, miles away, but we got there, parked and found a spot 400 metres from the finish on a bend not right at the front of the barriers but not too far back. The usual excitement as the various support cars and motor bikes arrived horns sounding and lights flashing. A few of the motorbikes nearly didnt take the bend which was a bit worrying. Then the helicopters were overhead, always a sign the riders are coming. The boys in Lycra streamed towards us and suddenly one went down right in front of us, he,d touched his brakes, gone down and taken out the sprint race leader, Matt Goss, who lay on the road before us and Mark Cavendish had to take evasive action ruining his run up to the finish. A big crowd built up round us but I was too upset to look at the poor guy in the road and distraught that the officials had made the finish so dangerous. Eventually Matt Goss was able to stand up and get back on his bike looking pale and shocked, we gave him a huge round of applause. The boy who caused the incident, he had been the stage winner the previous day, broke his wrist and withdrew from the race. So I really didn't see much of the event and had no idea who won the stage till we got home. That was our last chance to see live racing as the Giro moved into Umbria. Today I watched the stage on tv and saw the rider who took Mark Cavendish down in an earlier stage take the sprint to win. As Cav said afterwards the guy did a great sprint but shouldnt even be in the race after his dangerous behaviour Again there was a bend just before the final few hundred metres, again riders went down. So much as I love the Giro it hasnt been quite so wonderful this year, thrills and spills but I really could do without the latter. Otherwise the weather is lovely, the garden is looking great, Mr FF is painting radiators and my brother and his wife arrive in Sunday for a week which means trips out and gelato, with tv Giro highlights in the evening. Yes, we are off to Italy again. Packing a small carry on case to last me three weeks, trying to include more going out clothes and less work wear as we have no big project planned for this visit. Sock yarn is selected, paperbacks picked. Meantime, I've been working really hard in my Scottish garden, I have to say it's looking the best I've ever seen it so I'm a little reluctant to miss the spring activity but then I'm wondering about the sunflower and herb seeds I planted in Lazio. I did think I would l grow less this year in Scotland but it seemed wrong to leave the veggie patch empty so I have planted potatoes, beans and peas, and what would a garden be without sweet peas, then there are the herbs and hanging baskets. The automatic watering system is set in the greenhouse, I got drenched this morning checking that all the pots were getting a drink. I always say I'll try to keep in touch, I will, I really will.